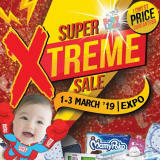 Get ready for the Highly Anticipated, Most Xtreme Baby Fair in March!! Baby Land is getting Bigger!! You can get everything you need and anything you want, all at just one Fair - Baby Land! The only baby fair that allows you to Save & Save while you shop & shop away! Get Craziest Offers up to 90% off on all Top Trusted & Premium Brands – Spectra, Medela, Graco, Recaro, Maxi Cosi, Ingenuity, Bright Starts, and many more! Hurry Grab All Exciting Perks.